A sumptuous and startling television film, Richard II offers a unique interpretation of Shakespeare’s tale of a monarch’s downfall. Two decades on, Illuminations is delighted to release this landmark production on DVD with extras featuring interviews with Deborah Warner and Fiona Shaw and a gallery of stunning stills. A compelling version of the RSC’s landmark production of William Shakespeare’s Henry VI trilogy and Richard III. Adapted and directed for the stage by Peter Hall and John Barton, The Wars of the Roses was acknowledged on its premiere in Stratford-upon-Avon in 1963 as one of the defining Shakespeare productions of the post-war years. Unavailable in Britain for over 50 years, this is the BBC’s compelling 15-part production from 1960 of Shakespeare’s great national pageant of eight History plays. Funny, passionate and exciting, an essential tool for anyone trying to get to grips with the Bard. MUSE OF FIRE will change the way you feel about Shakespeare forever. Set in a modern African state, this fast-moving political thriller of Shakespeare’s Julius Caesar is directed by the RSC’s artistic director, Greg Doran, and features a distinguished cast of black actors including Joseph Paterson. 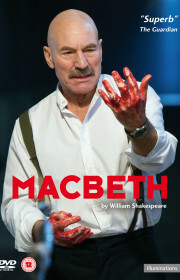 The Royal Shakespeare Company’s Macbeth has been lauded as the finest production of Shakespeare’s Scottish play for over a quarter of a century. In 2000, it played to packed houses in Stratford, London, and theatres abroad.